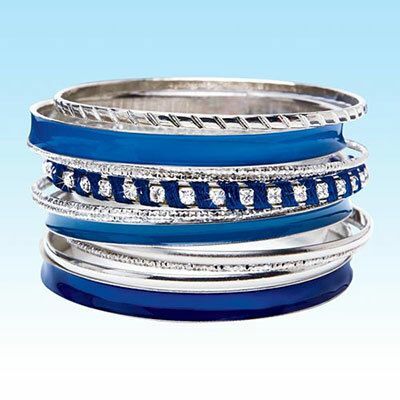 Stack these Blue and Silver Bangles up or slip them on one by one. Beautiful bangles give you plenty of options in a mix of silver-tone and shades of blue. Assorted styles. Approx. 2¾" dia. So sparkly - I love every one of them! In fact, I just wore them yesterday to an event& received many compliments on them. They look nice with a jean outfit also.